Team Wales travel to Australia's Gold Coast trying to beat the largest medal haul won in Glasgow four years ago. On that occasion, Wales won 36 medals, including five golds, making the 2014 Team Wales the most successful Commonwealth Games squad in history. That will be hard to surpass this time with a more likely target the record medal haul for an overseas games which stands at 25 achieved in Auckland in 1990. More than 200 Welsh athletes across 15 sports are travelling to Australia for the event, which will be held between April 4-15 with a further support staff of over 100. Wales won only a single track and field medal in Glasgow when pole vaulter Sally Peake claimed silver on the final evening. Former world 400m hurdles champion Dai Greene has qualified after battling back from injury and will be targeting more Commonwealth Games success after winning gold in Delhi in 2010. Another hurdler, David Omoregie, was a world-class youngster and, after relocating to training in Jamaica, will be aiming to shine in his first Games in the 110m event. Josh Griffiths - who finished as the fastest Briton in his first marathon in London in April 2017 - will make his Commonwealth debut alongside compatriot Andy Davies in the men's 26.2 mile race. Reigning world champions Hollie Arnold and Olivia Breen will both aim to add Commonwealth titles to their CVs in the F46 javelin and T38 long jump events respectively - while Bethan Davies could win Wales' first race walking gold since Steve Barry, also in Australia, back in 1982. Beverley Jones and Dewi Griffiths were late withdrawals while there is no Paralympic champion Aled Sion Davies who does not have his events in the programme. Athletics (26): Hollie Arnold (para), Rowan Axe, Olivia Breen (para), Rebecca Chapman, Melissa Courtney, Andrew Davies, Bethan Davies, Caryl Granville, Dai Greene, Ben Gregory, Josh Griffiths, Jonathan Hopkins, Caryl Jones, Morgan Jones (para), Osian Jones, Rhys Jones (para), Elinor Kirk, James Ledger (para), Heather Lewis, Tom Marshall, Curtis Matthews, Jenny Nesbitt, David Omoregie, Carys Parry-Evans, Sally Peake, Ieuan Thomas. 2014 bronze medallist Lauren Price, 23, returns, while 2017 Commonwealth Youth Games champion Sammy Lee will make his senior debut. And 21-year-old Rosie Eccles from Chepstow makes the team just five years after discovering the sport through a boxercise class. Lynsey Holdaway, Mickey McDonagh, Kyran Jones and Billy Edwards make up the rest of Wales' 2018 squad. Boxing (7): Rosie Eccles, Billy Edwards, Lynsey Holdaway, Kyran Jones, Sammy Lee, Mickey McDonagh, Lauren Price. Team Sky's Luke Rowe will be on the Gold Coast despite breaking his leg in 25 places on his brother's stag trip last August. Defending road race champion Geraint Thomas, Owain Doull and Scott Davies all miss out as they concentrate on racing with their professional teams. Rowe's sister-in-law Dani has changed her allegiance to Wales after representing England in previous Games. London 2012 Olympic gold medallist Dani is married to Luke's brother Matt and has lived in Wales for more than five years. Olympic and world champion Elinor Barker will be looking to add a gold to the silver and bronze medals she won in Glasgow four years ago. Barker's younger sister Megan is also included for her Commonwealth Games debut. Former double world champion James Ball will ride in the men's blind and visually impaired event with guide Pete Mitchell. Fifteen-year-old diver Aidan Heslop is Wales' first Commonwealth diver since Bob Morgan in 1998. Heslop trains at the Plymouth club at which Tom Daley started his career. Wales will have 13 participants in rhythmic and artistic gymnastics as they look to improve on 10 medals won in Glasgow. 2017 British floor champion Maisie Methuen is included in the five-woman artistic team. Jac Davies, Iwan Mepham and Clinton Purnell all return for a second time in the men's squad. Led by Frankie Jones, Wales' rhythmic gymnasts came away from Glasgow with eight medals. Jones won six of them. 21-year-old Laura Halford - who won a silver and two bronze medals at Glasgow 2014 - is one of three rhythmic gymnasts this time around. Commonwealth debutants Gemma Frizelle and 15-year-old Abigail Hanford complete the women's rhythmic gymnastics team for 2018. Gymnastics (Artistic) (10): Latalia Bevan, Josh Cook, Jac Davies, Benjamin Eyre, Holly Jones, Iwan Mepham, Maisie Methuen, Clinton Purnell, Jolie Ruckley, Emily Thomas. Gymnastics (Rhythmic) (3): Gemma Frizelle, Laura Halford, Abigail Hanford. Qualification was confirmed in December 2017 as Wales' men and women's teams reached the top 10 in the latest Commonwealth rankings. The Gold Coast event is only the second time both teams have qualified for the Games since 1998. Lewis Prosser and Luke Hawker will share the captaincy duties for the men's squad while new captain Leah Wilkinson will lead the women's squad who include Xenna Hughes, daughter of Southampton manager and former Wales striker Mark. There were late changes to both squads with 18-year-old Caro Hulme replacing midfielder Danielle Jordan, who broke a thumb in a practice game. Cardiff Met defender Ioan Wall came into the men's squad for the injured Jonathan Gooch. Hockey: Men (18): James Carson, Alf Dinnie, Owain Dolan-Gray, Jacob Draper, James Fortnam, Benjamin Francis, Gareth Furlong, Rhys Gowman, Luke Hawker, Dale Hutchinson, Hywel Jones, Stephen Kelly, David Kettle, Dan Kyriakides, James Kyriakides, Lewis Prosser, Rupert Shipperley, Ioan Wall. Hockey Women (18): Beth Bingham, Sophie Clayton, Lisa Daley, Tina Evans, Sian French, Isabelle Howell, Xenna Hughes, Caro Hulme, Ella Jackson, Sarah Jones, Eloise Laity, Natasha Marke-Jones, Phoebe Richards, Delyth Thomas, Roseanne Thomas, Jo Westwood, Julie Whiting, Leah Wilkinson. Jess Sims and Laura Daniels became Wales' first world bowls champions since Janet Ackland in 1988 when they won the title in New Zealand in December, 2016. Now they hope to go for gold again at next year's 'pinnacle' Commonwealth Games in Australia. Lawn bowls (17): Anwen Butten, Laura Daniels, Stephen Harris, Jonathan Hubbard (para), Raymond Lillycrop (para), Gilbert Miles (para and Byron John parabowls VI director), Ross Owen, Daniel Salmon, Jess Sims, Caroline Taylor, Julie Thomas (para and John Wilson parabowls VI director), Jonathan Tomlinson, Pauline Wilson (para), Emma Woodcock, Marc Wyatt. Welsh Netball will have interim coach Julie Hoornweg in charge for the event in her home country for the event. Hoornweg 's appointment came following recent upheaval with coach Trish Wilcox having left the role after World Cup qualifiers disappointment. Wales have recalled Chelsea Lewis for the Gold Coast Commonwealth Games after she reversed her decision to take a break from internationals. Netball (12): Fern Davies, Suzy Drane, Bethan Dyke, Kyra Jones, Nia Jones, Chelsea Lewis, Sarah Llewelyn, Kelly Morgan, Cara Lea Moseley, Georgia Rowe, Leila Thomas, Amanda Varey. Wales wing Hallam Amos and flanker Justin Tipuric have been drafted into the men's squad alongside regular sevens players. Rio 2016 Olympian Jasmine Joyce is part of the women's squad that includes a host of Six Nations regulars. Rugby Sevens (Men) (12): Hallam Amos, James Benjamin, Ethan Davies, Owen Jenkins, Luke Morgan, Angus O'Brien, Ben Roach, Adam Thomas, Justin Tipuric, Luke Treharne, Morgan Williams, Tom Williams. Travelling reserves: Tomi Lewis, Harry Millard. Rugby Sevens (Women) (12): Sinead Breeze, Alisha Butchers, Laurie Harries, Sioned Harries, Hannah Jones, Jasmine Joyce, Kayleigh Powell, Shona Powell-Hughes, Gemma Rowland, Elinor Snowsill, Philippa Tuttiett, Sian Williams. Travelling reserves: Beth Lewis, Lucy Packer. Welsh clay shooter Ben Llewellin has broken a world record ahead of his first Commonwealth Games. Llewellin, whose father David was a two-time British Rally Champion, will compete in the shotgun discipline. The 23-year-old from Pembrokeshire is ranked fifth in the world. David Phelps, who won Commonwealth gold in 2006 in Melbourne, is also included. Shooting (11): Craig Auden, Mike Bamsey, Sian Corish, Jonathan Davis, Coral Kennerley, Ben Llewellin, Gareth Morris, David Phelps, Chris Watson, Mike Wixey, Sarah Wixey. Shooter Llewellin: from a world record to Commonwealth gold? Tesni Evans became the first British champion from Wales in February 2018 and is a genuine medal contender. Evans and Peter Creed also won bronze medal success at the World Squash Championships in August 2017. Squash (4): Peter Creed, Tesni Evans, Joel Makin, Deon Saffery. Commonwealth Games 2014 swimming champions Jazz Carlin and Georgia Davies will compete again. Carlin will be competing in her fourth Games after making her debut as a 15-year-old in Melbourne 2006. The pair are joined by Chloe Tutton, who narrowly missed out on a medal in the 2016 Olympics in Rio, while 2014 Commonwealth Games bronze medallist Daniel Jervis is also included. Swimming (14): Jazz Carlin, Xavier Castelli, Georgia Davies, Kathryn Greenslade, Calum Jarvis, Daniel Jervis, Ellena Jones, Harriet Jones, Alex Rosser (para), Beth Sloan, Alys Thomas, Jack Thomas (para), Chloe Tutton, Harriet West. 11-year-old Anna Hursey has been the headline act in the build-up to the Gold Coast after the Cardiff schoolgirl was named in the squad in January 2018. Hursey will be 11 years and 286 days on 4 April the day of the Gold Coast opening ceremony. Table Tennis (4): Charlotte Carey, Anna Hursey, Joshua Stacey (para), Chloe Thomas. 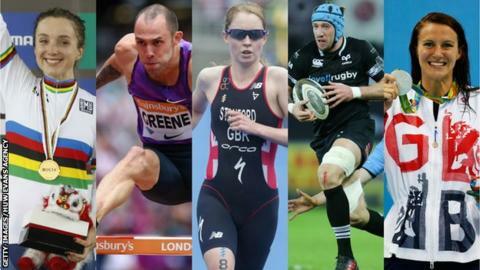 The 29-year-old from Swansea will lead the team of more than 200 athletes out at what is her first Commonwealth Games. Stanford narrowly missed out on a triathlon bronze medal at the Rio Olympics in 2016 and was ruled out of the 2014 Commonwealths by injury. She will also take part in the mixed relay event two days later. Injured Liam Lloyd has been replaced by Christopher Silver. Triathlon (4): Iestyn Harrett, Olivia Mathias, Christopher Silver, Non Stanford. Christie Williams, who competed four years ago, and 2012 Olympian Gareth Evans are joined by teenage debutants Catrin Jones and Jordan Sakkas. Faye Pittman, who was selected for Glasgow but had to pull out injured on the eve of the opening ceremony is also selected. Hannah Powell, who represented England in 2014, will compete after recovering from a dislocated elbow. Weightlifting has provided Wales with its most medals (51) at Commonwealth Games. Weighlifting & Powerlifting (16): Seth Casidsid, Gareth Evans, Sean Gaffney (para), Tayla Howe, Laura Hughes, Catrin Jones, Holly Knowles, Harry Misangyi, Joshua Parry, Nerys Pearce (para), Faye Pittman, Hannah Powell, Jordan Sakkas, Nathan Stephens (para), Rhodri West, Christie Williams. Both Kane Charig and Curtis Dodge are former judo players who have switched to wrestling. Dodge actually competed for Wales at the 2014 Commonwealth Games in judo. Both wrestlers train under the supervision of Alan Jones in Cardiff. Wrestling (2): Kane Charig, Curtis Dodge.